I was all set to do a 6 x 4 album (because the album is really adorable) but then I also recently acquired a gold Seven Paper Handbook and I’m thinking maybe 6 x 8 is in the cards after all. The album is gorgeous and gold for me feels very holiday. And all that’s well and good but you know how sometimes you buy an awesome 6 x 8 album and you pop in your 6 x 8 page and it’s just a bit too short to actually fill the page protector? That’s happened to me a few times and every time, I just change the size of my page to 6 x 8-1/4 and I’m good to go. This year, I will mix in my designs with Ali’s as I’ve done in past years. 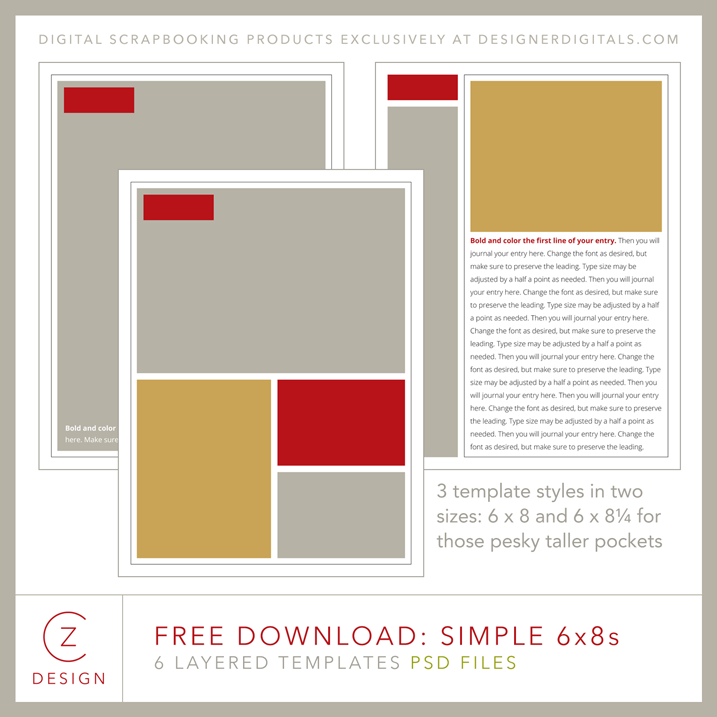 I created a free template set that includes three different page designs, but in two sizes: regular and tall. If you have an album with those taller pockets, use the tall files. If not, the regular. The download includes a simple How To PDF for those of you who are new to Photoshop or Photoshop Elements. 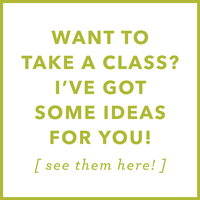 Or, if you’re really feeling adventurous, consider signing up for Digi Basics with Cathy Z. Of course, you can always email me with questions. Click on each image for more details and prices. 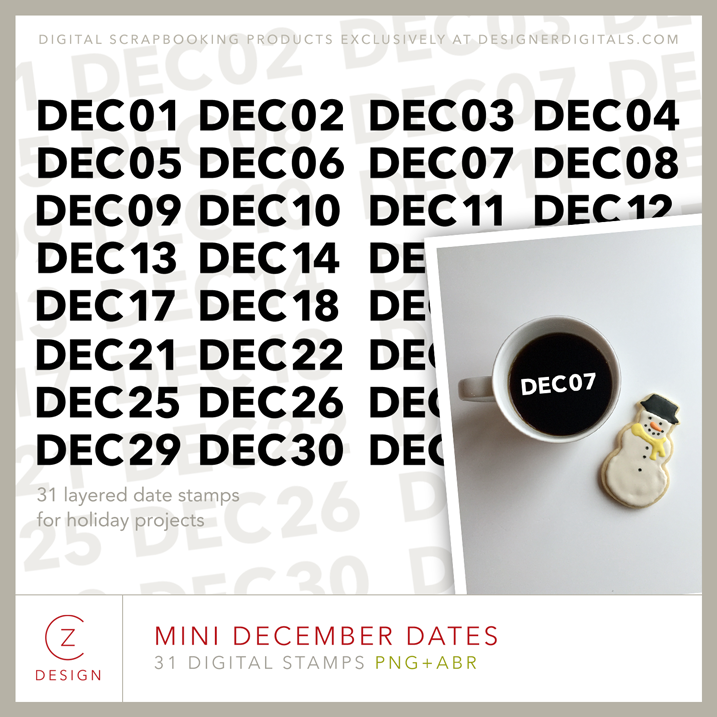 Mini December Dates are a set of small sized digital stamps designed to work perfectly with the free 6 x 8 templates. Those dates fit right into the red rectangle on the free templates. Easy peasy. 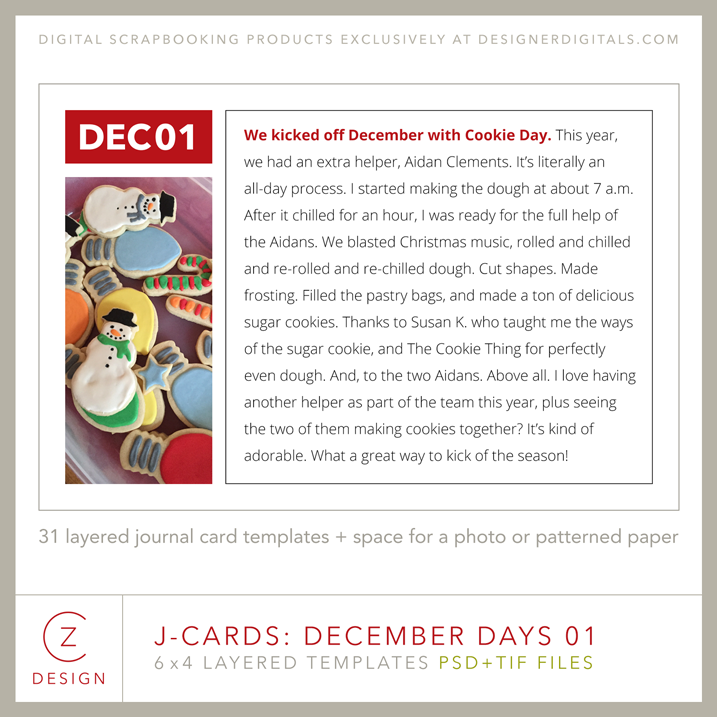 J-Cards: December Days 01 also match the 6 x 8s and include 31 simple, layered, numbered templates. I plan to work these into my album in December. J-Card: December Days 02 are simply the 3 x 4 matching card. 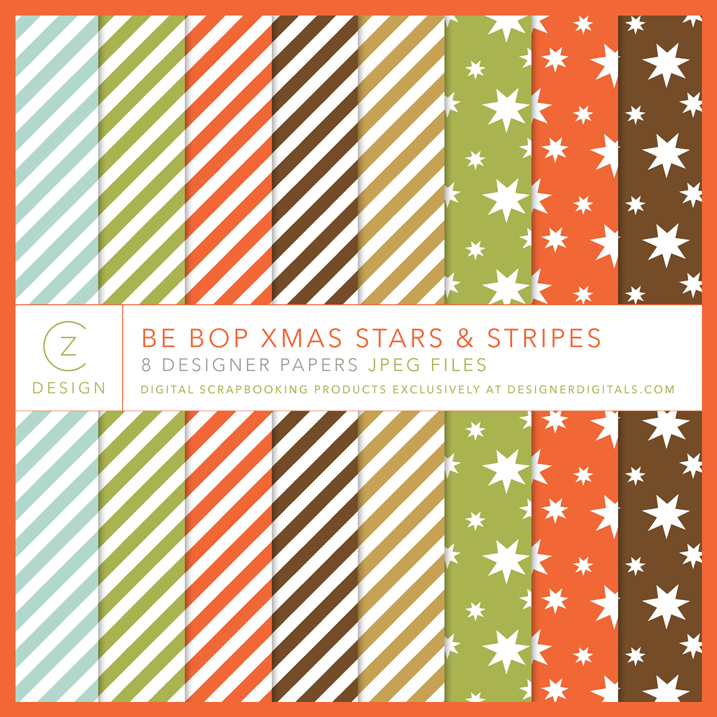 I added two more digital papers to the Be Box Xmas line. 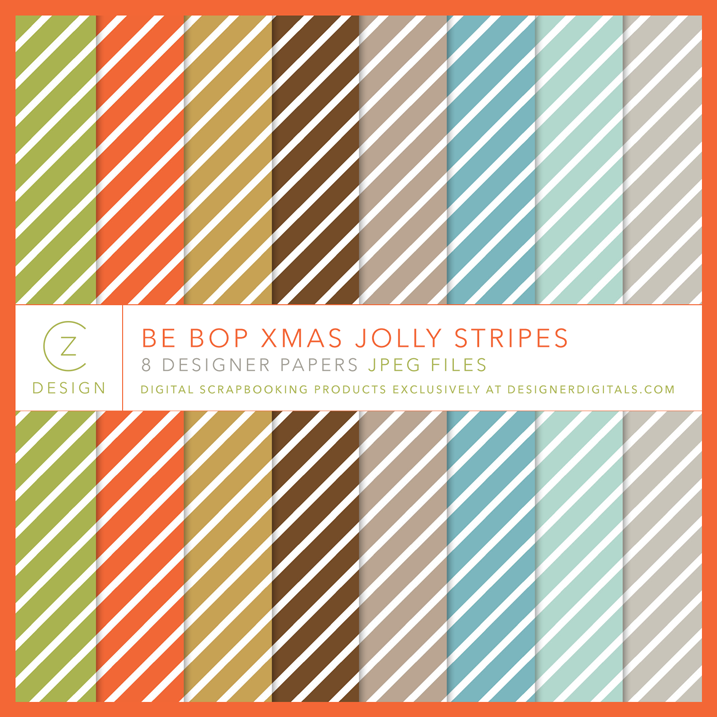 This set features the Be Bop colors in a wider color stripe. And this set features an even stripe plus a few stars patterns. And yes, I will be incorporating these digital papers into the hybrid stuff I’ll be adding to my album. Finally, two new 12 x 12 album sets. Say hello to The 12 x 12s. 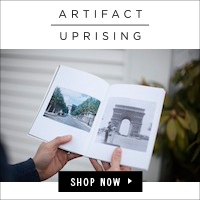 Each set features the same page margins, designed to work in any printed book. I always worry about those margins being too narrow. These sets offer a lot of options for photos and stories, while ensuring your content won’t get cut off in the binding. Suffice to say, I was a busy little bee this week. A few of you have asked if I will be releasing a holiday card design this year. My answer: maybe. If I have one in my brain, it’s gotta happen this weekend or not at all, so stay tuned! Enjoy the free set and have a great weekend! Thank you for the free set! I absolutely love all the new goodies! I will definitely be shopping today! I don’t do the December Daily from Ali because I feel it is an outrageous price. However, I love your digital sets and coordinating papers, so that is much more doable for me! Thank you, and I hope you and your family have a safe and happy holiday season! And by the way….I LOVE the new 12×12 sets! Those are going to be soooooo useful for so many things for me! I will definitely be getting both of those sets! Thanks for creating such a useful, multi purpose product! 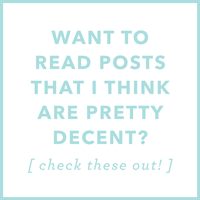 You are, without a doubt, the most generous scrapbooking blogger ever. I am in for Ali’s December Daily, so many, many thanks for being able to scrap it ‘Cathy’ style! thank you for the free set! Thank you for the free template set, Cathy! Thanks for the free download! These will be useful for a lot of different projects. Hope you have a relaxing weekend after your busy week! Many thanks for the 6×8 set Cathy – those tall once will make me feel a lot happier! Many thanks for the 6x8s Cathy – the tall set will make me feel much happier! Cathy you are the best! I was thinking about letting DD go this year due to not having time to decide on supplies, design etc. It felt overwhelming. 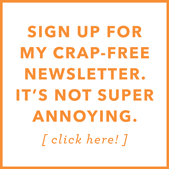 But free, gorgeous, and best of all simple templates? It feels doable again, thanks so much!!! Thanks so much for the free set! Do you print your own 6×8 pages at home, or do you send them off to somewhere? 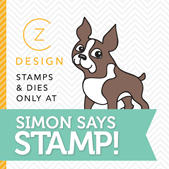 I guess I’m curious as to which templates to use for sending off to say Persnickety Prints. Also, thanks much for the free templates! Just printed the tall for practice, they fit perfectly in my binder! Thanks again! Many thanks for the 6 x 8s Cathy. The are very welcome as I hate the large gap at the top! One other question, sorry… what kind of photo paper do you use to print on? 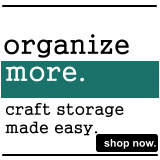 Or do you use card stock? Hey Sindee, well… I have a stash of 8.5 x 11 Ilford Gallerie Smooth Pearl photo paper. Sadly, they aren’t making it anymore! But that is for photos. While I can’t use the free 6×8 templates as I bought the 4×6 album, your new adorable digital files from DD will work very nicely. And I can use the freebies for another project. Thanks so much. You’ve made my day!!! Thank you for the templates! I got a gold binder too, and last night I was prepping and slipping in my 6×8 pages…and yeah, way too short. Dagnabbit! Why do they do that?? 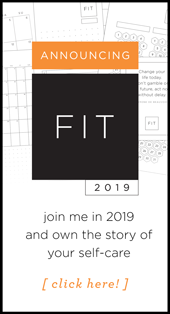 Thanks so much Cathy 🙂 I love the clean style of your templates… it leaves so much room for my own personality and creativity to shine through. The freebies are gorgeous… thanks heaps! As always. . .AWESOME!! One question. Do you know which version would fit into a Becky Higgins Project Life 6 x 8 binder? I just found the most adorable red plaid binder that would be soooooooooooooo awesome for December Daily and wanted to know if the “tall or regular” fits into her page protectors? I can always print them and find out for myself, but I’m thinking in your “awesome-ness” you have probably figured that out. Can you let me know if you have or not. Gonna give it a whirl and see which one works. I’ll let ya know! Thanks for the free template set! And I LOVE these new 12×12 sets! Thanks so much for the Rene set. I have all you’re 6×8 templates!! I look forward to seeing your December daily album. Wow, Cathy, you ROCK! Thanks for these awesome free templates. I can’t wait to use them in my December Daily album along with some of Ali’s templates. Happy weekend! thank you for the free set! you are always so generous in sharing your talent. I always pick up a few ideas from your DD, so can’t wait to see your pages 🙂 …happy holidays! Thank you so much. You are more than generous!!!! What a lovely gift. Thanks Cathy! I’m going to get the Mini December Dates to use with the 6×8 templates. Thank you so much for sharing! 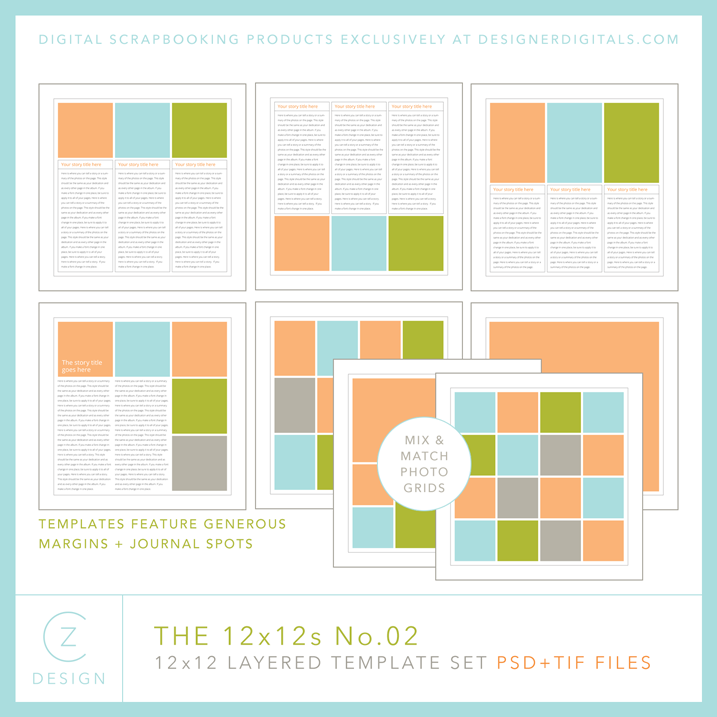 Day 20 – Thankful for the free 6×8 templates from the fabulous Cathy Z! Very generous! Thanks for the 6×8 – perfect for my DD this year. I so loved your album last year, that I’ve stocked up on past christmas sets. I’m so torn; This years christmas products doesn’t fit my chosen colour scheme – so I’m still undecided about those. I say go with what you have already. I am going to work with this new Be Bop color scheme, I think. I guess i’ll have to see how it all looks when i start printing. But i really like my stuff from last year too! Thank you so much for the new 6×8 templates. I’m planning on using them for my December memories album – going to be working through Debbie Hodge’s new December Story class with the family. Love having such a great set of templates! Thanks for the template set. I own most of the others and will add this to my collection. And I liked the holiday card from last year. Looking forward to seeing a new one. 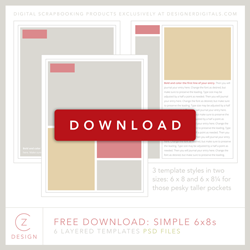 Thank you, thank you for the freebie template, love it! 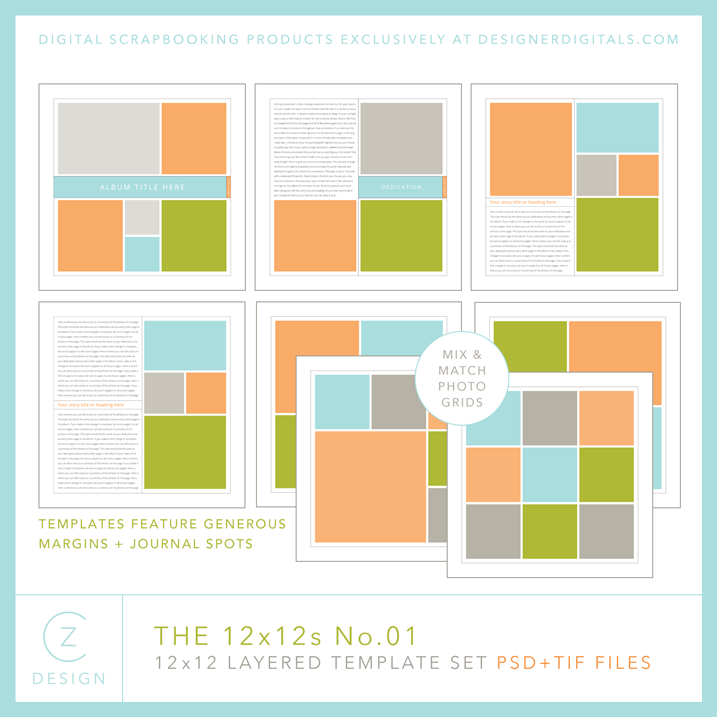 I am also in love with your two new sets of 12X12 templates. They are a must have. Great products Cathy! Thank you very much for the templates, Cathy! I haven’t tried this size before but I will give DD a try this year. I’m scratching my head wondering did I attempt it last year? Oh well, I am doing it this time!!! 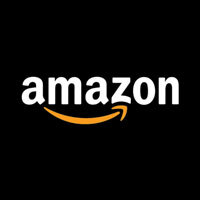 I will be shopping for some of the wonderful goodies you shared with us here! Have a wonderful Thanksgiving! You are SO generous, Cathy! Thanks a bunch. I have most (all?) 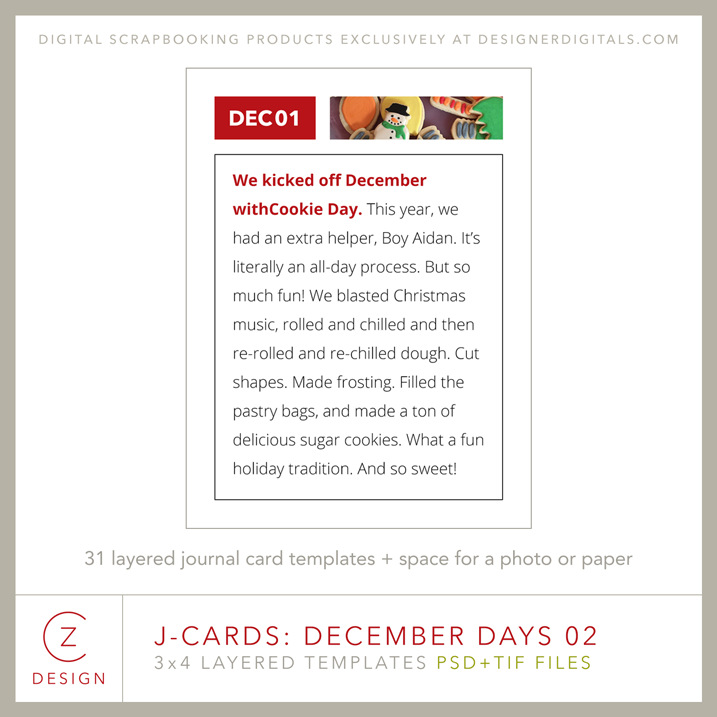 of your 6×8 templates & use them for my Project Life pages and last year’s December Daily. I am anxious to see your DD for this year. Happy Thanksgiving! Love the templates, thank you so much!!! Love, love, LOVE the template set – thanks for sharing. Can’t wait to see your DD, day by day, as I am a bit of a copy cat! Purchased Ali’s main kit, plus Kelly Purkey’s add-on, but I just KNOW I’m gonna be going the way of the CZielske…love your simplicity. Thank you for the freebie…and all your goodies!